Q: What is the purpose of poetry? A: Why an Ars Poetica of course. A: Well, being a Latin phrase “ars poetica” is translated “on the art of poetry” in English. And art by definition allows the imagination to speak. Art shows. Q: So how does poetry show? A poem is an orange balloon against the blue sky. A poem is a gift-wrapped pair of well-worn sneakers. A poem is a baby crying at the end of a nap. A poem is a collection of musical notes. A poem is a silver spoon diving into vanilla ice cream. A poem is honey on the tongue. Example – A poem is river tumbling stones. How does a poem look? Example – A poem is a glass tower in gloaming. How does a poem feel to the touch? Example – A poem is nestled in velvet and fingertips stroking bark. How does a poem taste? Example – A poem is cayenne smothered in chocolate. 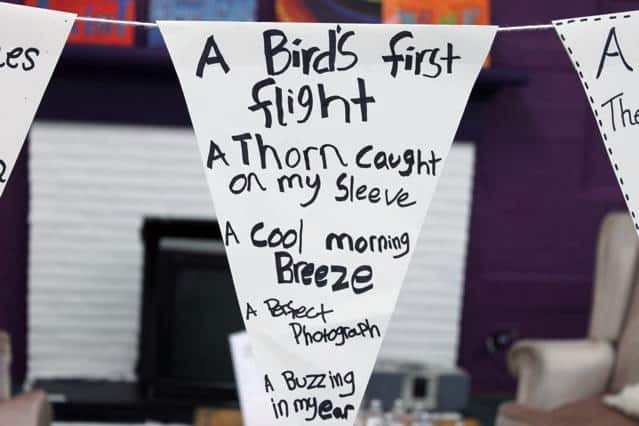 How does a poem smell? Example – A poem is honeysuckle on a warm spring day. Where does a poem take the reader? Example -…to stars hanging in night sky. If your poem was on the moon, how would it survive? If your poem was on stage, what would it wear and how would it act? If your poem was a bird, what would it see? What if your poem went exploring? Keep imagining until you have a page of ideas. A poem is the clap of rain, the trumpet of thunder and takes me to stars hanging in the night sky. clinging to the night sky. As you see, each sentence will be crafted to a single stanza. Try another and another. Soon you will have your Ars Poetica. This entry was posted in Creative Writing and tagged poetry, writing prompt on January 19, 2014 by WHWPAdmin.